If you are looking for a simple and budget-friendly griddler, you are most probably confused in choosing between Cuisinart GR-1 and Cuisinart GR-11 right now. As a matter of fact, the two products are available around similar prices. More often than not, you may find Cuisinart GR-11 to be just a little bit more expensive than Cuisinart GR-1. This is because Cuisinart GR-11 is basically an update for Cuisinart GR-1. So, is there any difference between Cuisinart GR-1 and Cuisinart GR-11? Let us see in the article below. The very first difference that you need to know is the added functionality. The manufacturer has changed the design of Cuisinart GR-1 in Cuisinart GR-11 to add more functionality. Previously, Cuisinart GR-1 is a griddler that can only function as a panini press and a sandwich maker. If you insist, you may use it for steaks or burgers, but mind the thickness of the food because it may not have enough power and sufficient grease drainage. 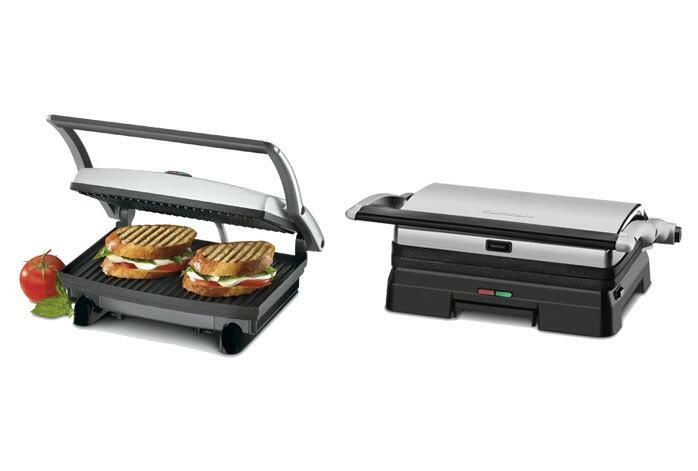 Cuisinart GR-11, on the other hand, is a three-in-one griddler, combining the functionality of panini press, sandwich maker, and griller into one neat compact device. Cuisinart GR-11 has been sophisticatedly designed with adjustable front feet, allowing better grease drainage. Thus, as the effect, Cuisinart GR-11 is also slightly bigger and bulkier than Cuisinart GR-1. The next difference is the grill plates. Previously, on Cuisinart GR-1, the grill plates are non-removable. Because of that, the cleaning process can be a little bit tricky to perform. Luckily, the grill plates are also non-stick, so there should be no ridiculous stain or grease that is hard to remove. Still, this is an object for improvement; Cuisinart GR-11 now comes with removable non-stick grill plates. Don’t worry; the grill plates are locked firmly in place when in use. Also, the grill plates are dishwasher-safe, making them very easy to clean. Last but not least, Cuisinart GR-11 also comes with more preset temperature settings. Cuisinart GR-1 only comes with a single preset temperature setting for grilling sandwiches. So, there can be some guess work needed when you want to cook burgers or steaks. Conveniently, Cuisinart GR-11 now comes with preset temperature settings for grilling not only sandwiches but also burgers and steaks. Just choose the preset, and you are good to go! Finally, we recommend you to choose Cuisinart GR-11. It comes with an improved design that allows for better grease drainage. It is also much more convenient to use, thanks to the now removable and dishwasher-safe grill plates.